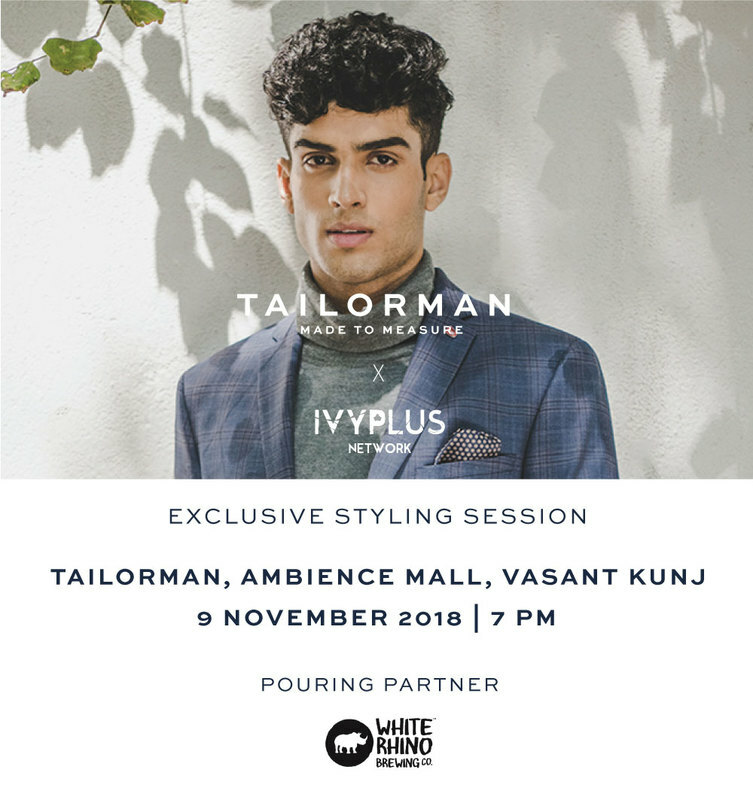 IvyPlus Network invites you for an exclusive styling session to celebrate the launch of TAILORMAN in Delhi. Tailorman is a premium made-to-measure brand that's been changing the landscape of menswear across cities in India since 2013. Newly launched in Delhi, they are bringing their "Find Your Fit" philosophy with an exclusive one-on-one styling session. Together, in a 1 hour Style Consultation, Tailorman’s lead stylist will help you determine what clothing is contextually appropriate for specific events and your personality. The session will also share valuable insights into the menswear industry and a tailoring perspective to how a suit should fit. 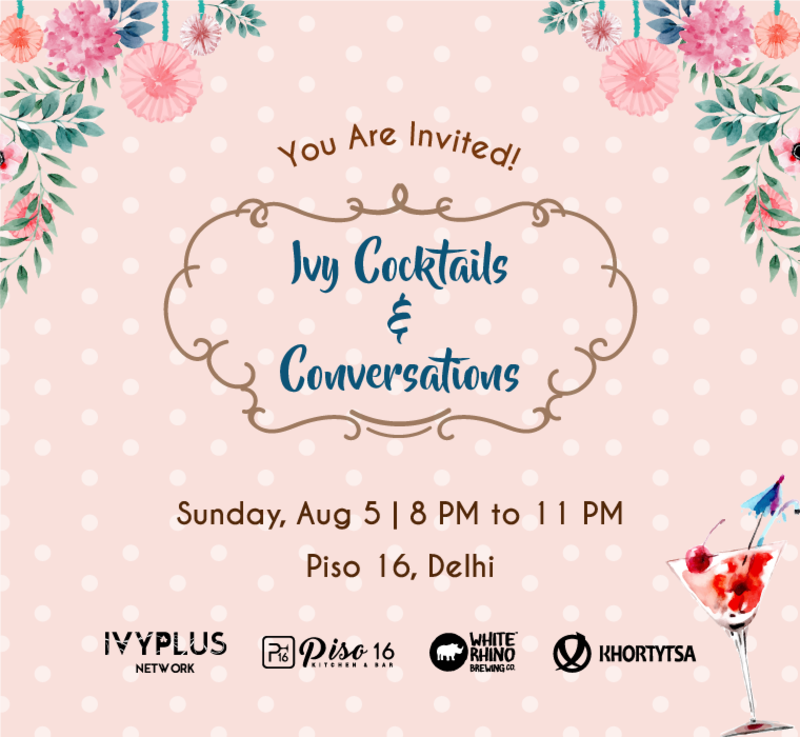 We’ll also have a networking session over beer and canapés for you to connect with other professionals from IvyPlus Network. Each attendee will receive a goodie bag from Tailorman! The event can accommodate a maximum of 40 IvyPlus members, so please RSVP soon to reserve your spot. Use promo code TMIVY15 to get 15% off on your first purchase at https://www.tailorman.com/. A special thanks to our beverage partner, White Rhino for partnering with us for this event. 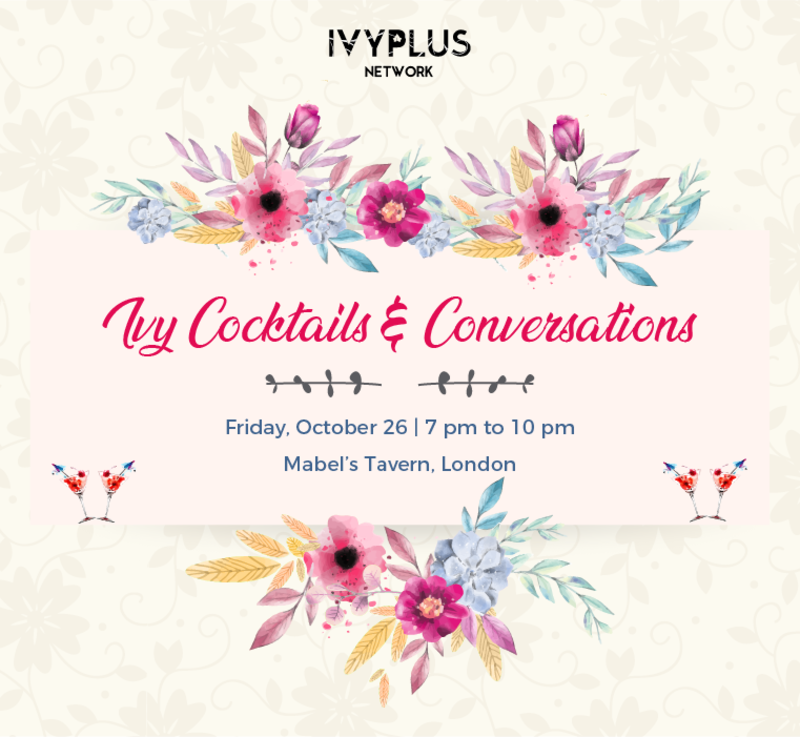 IvyPlus Network invites you to Ivy Cocktails & Conversations on Friday, October 26 at Mabel's Tavern in London. This would be an excellent opportunity to connect with alumni of Ivy League & other leading global universities. You're welcome to bring your +1 along. 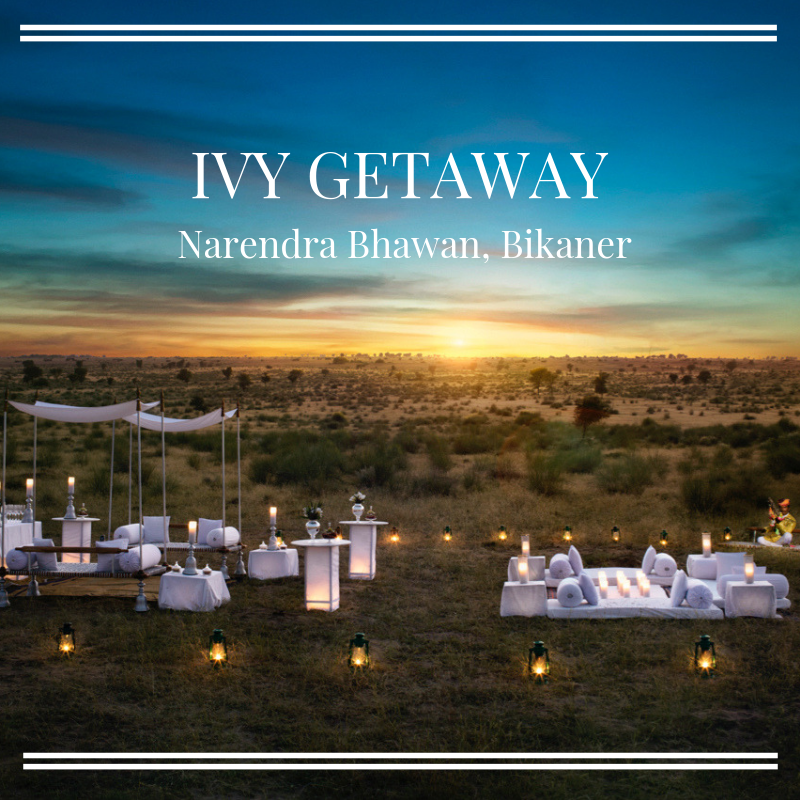 IvyPlus Network invites you for a Weekend Getaway to Narendra Bhawan in Bikaner. This Dusshera, join us on this curated experience planned for alumni of the top global universities. This is an opportunity to experience Rajasthani charm & hospitality while connecting with like-minded people at one of the most charming new hotels in India. To book, please fill in this form: https: http://bit.ly/2Q1hzOP and we'll get in touch. The Getaway is exclusively for alumni of top global universities. Your partner/a friend or a family member are welcome to join. 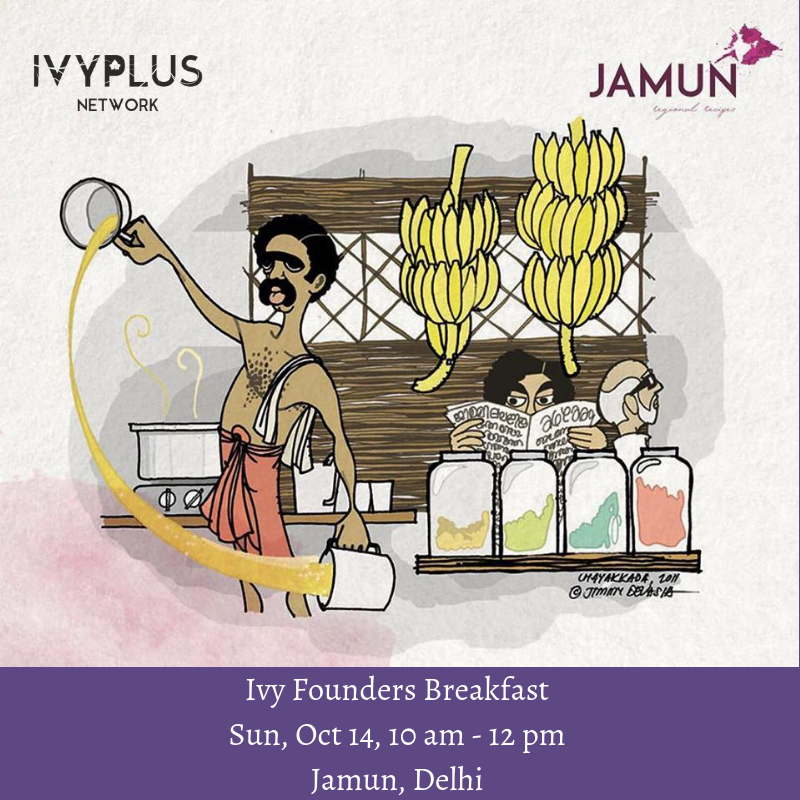 Ivy Founders Breakfast is an opportunity for startup founders to connect with the many tech entrepreneurs and partners within the IvyPlus community. It is an open forum where founders can be inspired, share ideas and knowledge, learn about opportunities, and make vital connections within the startup ecosystem. If you run an Internet startup, investing in one, or working at an Internet company, you are welcome to attend. Come for the community, stay for the comradery (and delicious regional Indian breakfast). We are hosting this one at Jamun, a Mangalorean verandah-style cafe, replete with terracotta-tiled canopy brimming with bougainvillea, arched windows, knotted cane furniture and glittering copper tableware. Jamun celebrates the regional diversity and the rich heritage of Indian cuisine. We would serve a delicious South Indian feast, complete with Idlis & Dosas, Uttapam & Appams, Sambhars & Chutneys. End the meal with some mean filter coffee! There are limited spots and they would be sold on a first come first serve basis. For questions, write to us at team@ivyplusnetwork.com. 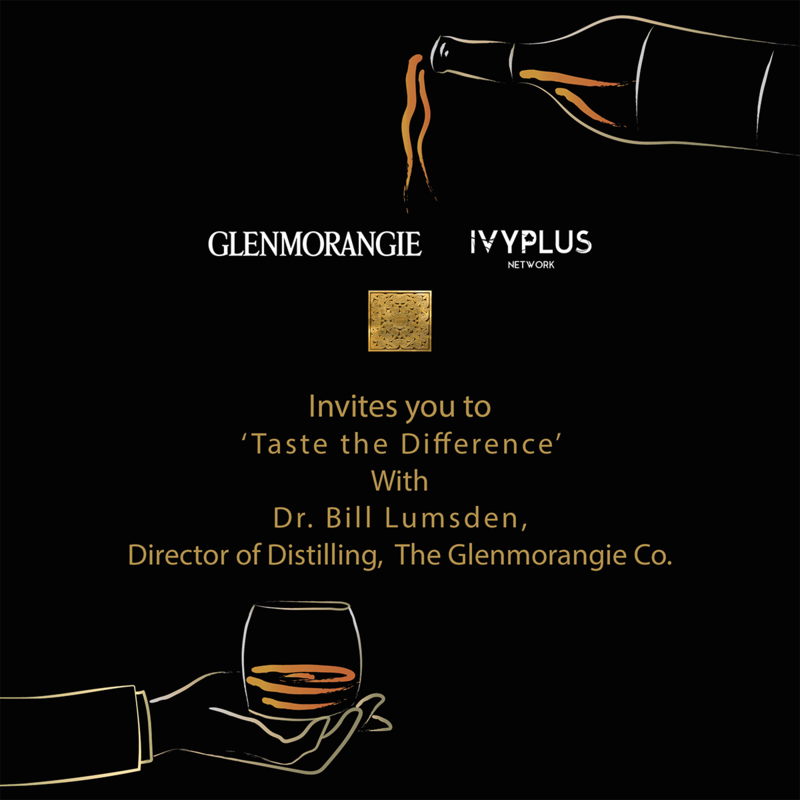 IvyPlus Network in association with Glenmorangie invites you to an exclusive whisky tasting with the Master of Single Malt, Dr.Bill Lumsden - Director of Distilling and Whisky Creation. This will be a sensorial and immersive journey as we take you behind the orange door, into the fascinating world behind one of the most iconic whisky brands. You would also have an opportunity to connect with other guests after the tasting, over drinks and canapés. The event is sponsored by Glenmorangie for 40 IvyPlus Members and spots are offered on first come first serve basis. So please RSVP soon if you'd like to attend. IvyPlus Network invites you to Ivy Cocktails & Conversations on Thu, Sep 13 in New York. This would be an excellent opportunity to connect with alumni of Ivy League & other leading global universities. Join us as we toast to a new beginning - Our first alumni meetup in New York. You're welcome to bring your +1 along. Please don't forget to bring a valid State Photo ID or your Passport for entry. This will be an unforgettable evening, and we can’t wait for you to join us! For questions, write to us at team@ivyplusnetwork.com or call us at 646-481-5919. 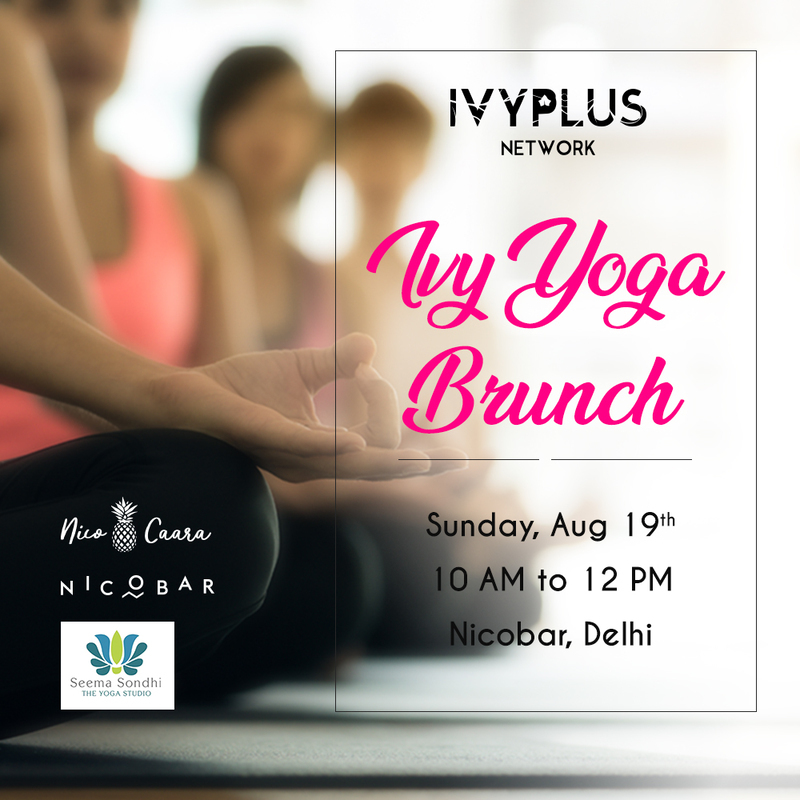 Join us for a wellness-inspired Sunday at Nicobar with celebrated yoga trainer, Seema Sondhi, who will be leading the group through a deeply restorative yoga session. This would be followed by a wholesome and nourishing brunch by NicoCaara, freshly prepared with their seasonal produce. Beginners are welcome and encouraged, and don’t forget to carry your yoga mat. The session promises to be both rejuvenating and refreshing! 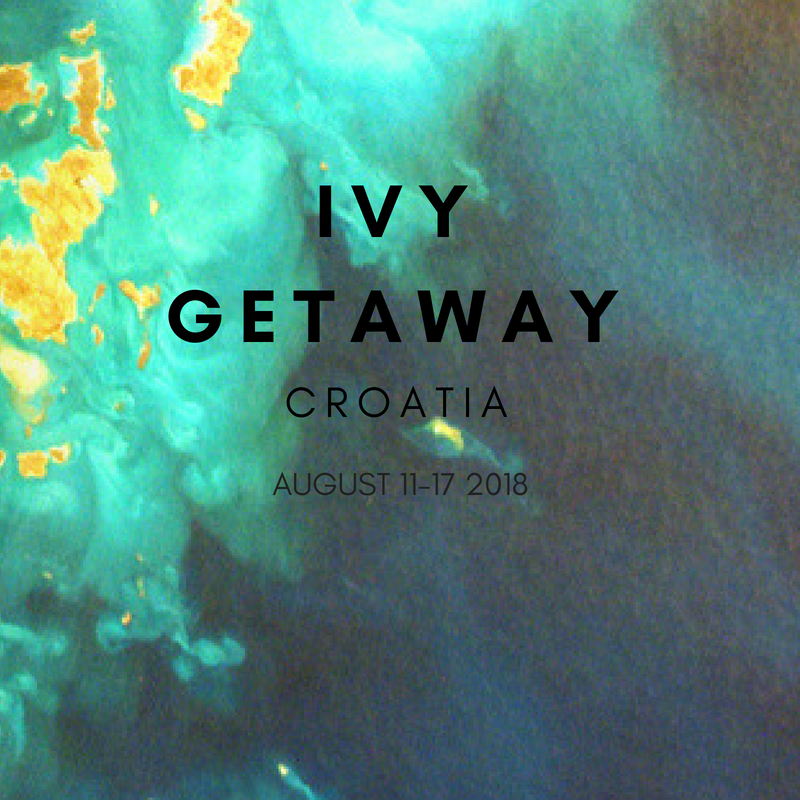 Experience the charms of Croatia, Europe’s best-kept secret, on a 7-day getaway this August with a small group of alumni from the top global universities. IvyPlus network in association with Active Holiday Company invites you for a 6N-7D getaway to Croatia. We'll stroll through charming little towns, bask under the Mediterranean sunshine, try the delicious local food, explore glowing sea caves, mingle with locals, laugh and make unforgettable memories. Join us for an evening of sharing laughter, conversation, and ideas with friends new and old at the Ivy Cocktails & Conversations. We are taking you to the brand new Piso 16, a chic cocktail bar on the 16th floor of Eros Towers with a breathtaking panoramic view of the city. This would be an excellent opportunity to connect with alumni of Ivy League & other leading global universities. You're welcome to bring your +1 or a friend along. Please get a ticket for them separately. Your ticket includes a welcome drink, canapes through the evening and taxes. We are grateful to our partners - White Rhino & Khortysa for their support in helping us organize this for our community. 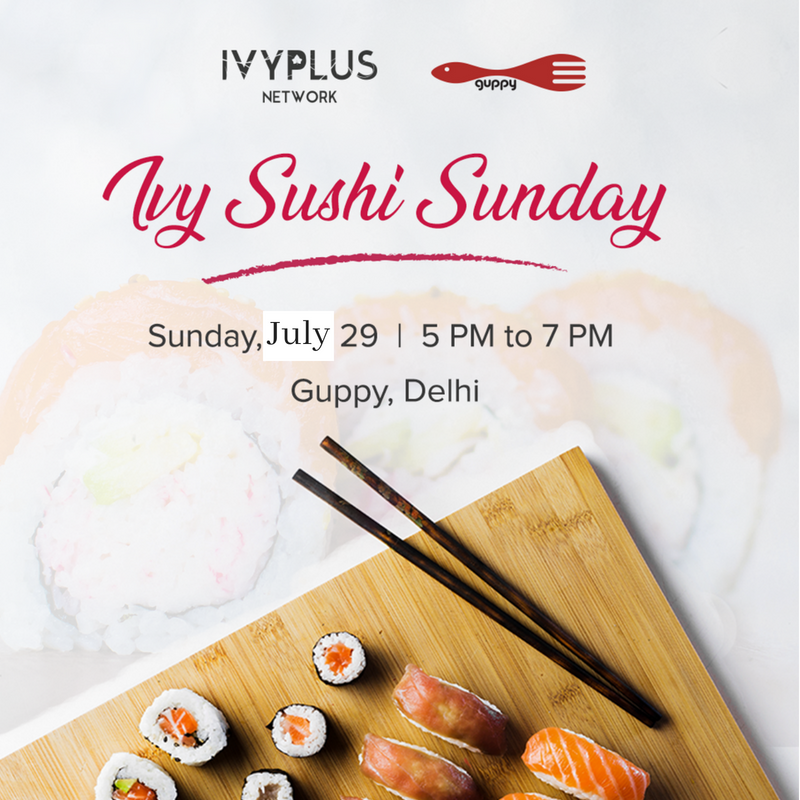 Learn the art of the roll from the Master Chefs at Guppy, take notes, perfect your sushi game and join us for a special Sushi and Cocktail night. We’ll discover the fundamentals of sushi rolling before diving in to create culinary masterpieces of our own - using fresh tuna, salmon, fish, and several vegetables. Once finished, we’ll be able to eat our rolls and enjoy cocktails to get our creative culinary juices flowing. What's included: 2 cocktails, sushi-making with trained chefs, Soup & Sushi, Recipes and Certificates! We have 15 spots for this curated experience, so book yours before they get sold out. Come learn new gourmet skills while enjoying a killer evening. We look forward to seeing you there!